It's our 4th week in the Pre-writing Activities for Kids Series here on the blog! So far we have looked at horizontal & vertical lines, circle shapes, and cross shapes! Today we are going to be look at squares and rectangles! I added in the rectangle shape with today's activity and that is a great way to talk about big lines vs. small lines that make up the shape! Squares, of course, are 4 straight lines all together. They can either be big or small! I am really excited to share today's activity with you! 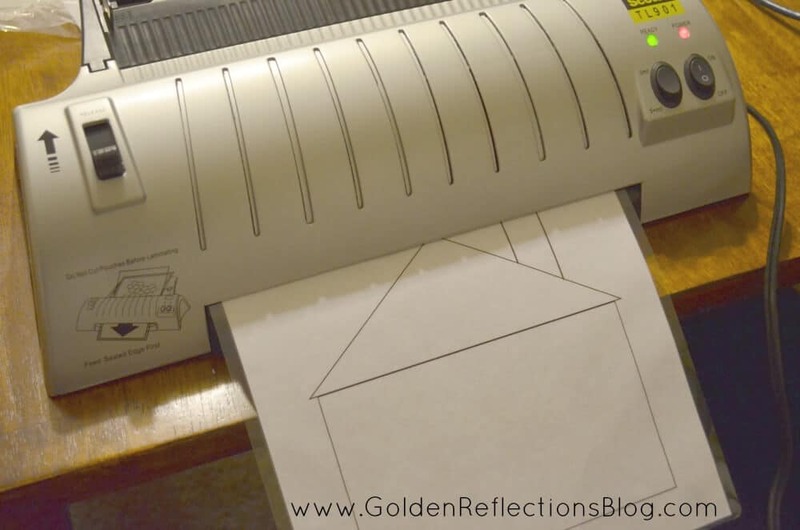 There is a FREE printable with everything you will need (except the laminator, haha) to complete this activity! It is a DIY puzzle that I made with the square and rectangle shapes. I also added one triangle for the roof and there are also lots of ways you can practice all the previous pre-writing strokes we have talked about in this series! 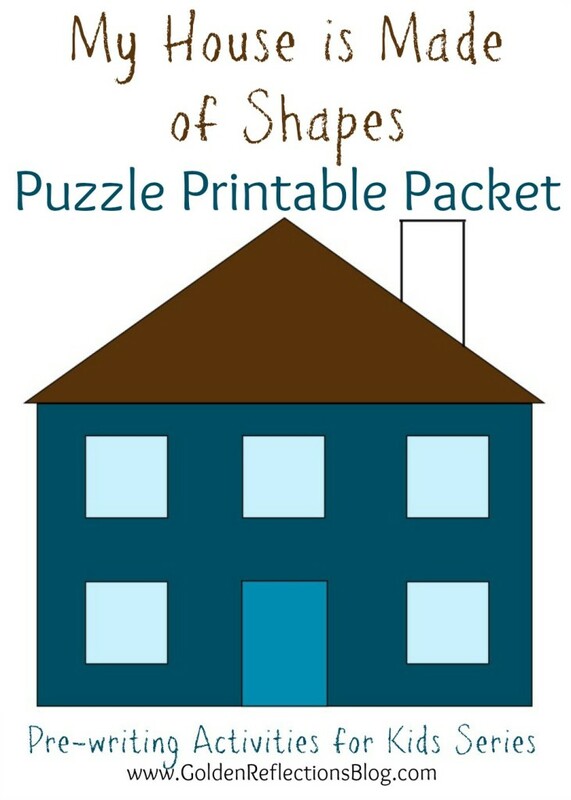 Print out the My House is Made of Shapes Puzzle Printable Packet that I provided above! The first page that comes in the packet is this one pictured below. I used a red marker so you could see the sentence, but the letters are made of dashed lines so your child can trace the sentence. This part of the activity will only be age appropriate for older children, ages 5 and up! The next two pages on your puzzle pieces. Your child will be coloring these pieces before you cut them out. This is a great time to practice proper grasp on their crayons! The house on the bottom left is a model for when your child puts the puzzle together. That is what the finished product will look like, so if you have a child who needs that extra visual of where the pieces go you can have it sitting close by so they can look at it. The rectangle on the right with the windows and doors on it you will want to have them color the entire thing the same color. The windows and doors on this piece are where the other pieces will go once you have everything cut out. This is also a great time to practice coloring inside the lines. Ages 4 and under it is age appropriate to have deviations outside the coloring line up to 1/2″. Over age 4 it is age appropriate to have deviations at 1/4″ outside the coloring line. Another option to bring in all the previous pre-writing strokes is to have your child draw the cross shape on their windows before you laminate. They are getting in some good practice of writing a line down (vertical lines) and a line across (horizontal lines) to make a cross shape! After they have colored everything, here is where you can decide if you want to laminate all the pages! I highly suggest doing this! It will make the pieces easier for your child to pick up and will also help the puzzle to last longer! This was my first time using my new laminator that I found on Amazon for only $19.99 during Christmas time!! Right now it is on sale for $27.22, still a great deal! It is the Scotch Thermal Laminator Two Roller System. It comes with two laminating pouches and I used both for this activity. So you will want to make sure you order an extra set of the laminating pouches so you will have more for other projects! It was super easy to use and I can't wait to use it again for another project! Just a little note, you will want to do this part yourself. The laminator does get hot so it is not appropriate for younger children to use. Once you finish laminating then you can have them cut the pieces out. On the large blue rectangle that I colored above, again just have them cut the entire shape out. Do not cut out the windows and doors on that piece, they are guidelines for where to put the window and door pieces that you will be cutting out. Remember to practice a good grasp with the scissors as well. Both thumbs up, or thumbs up position and one hand holding on to the paper as they cut. If the piece of paper is too hard for them to manage while cutting, you can cut it in half or into fourths to make it more manageable to hold during cutting. Some of the pieces are a little small, so they will not be appropriate for ages under 4 to cut out. However, my 17 month old still enjoyed playing with this after I had put it all together myself. Use your judgement as to how much of it your child can handle. And here is the finished product! The house on the page with the sentence is the guideline of the puzzle. 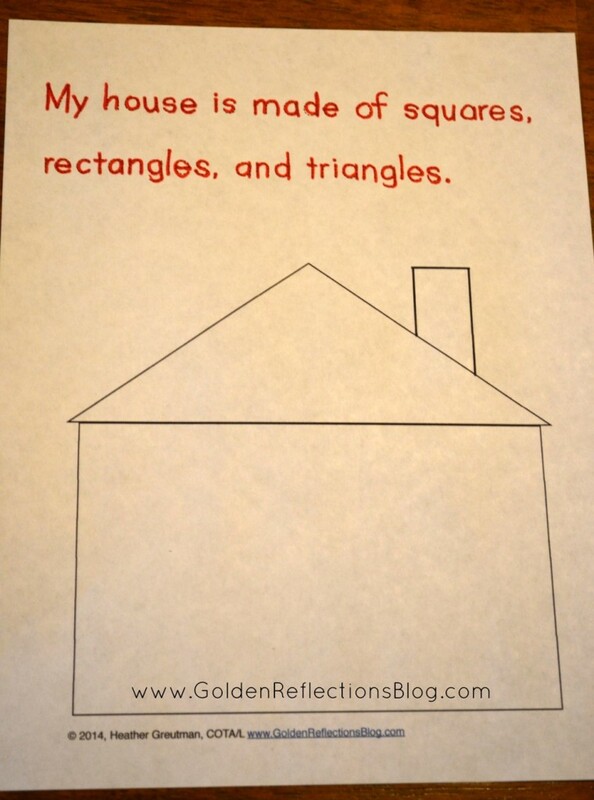 Your child can then place the cut out rectangle onto, the triangle shape for the roof, and also the chimney piece. 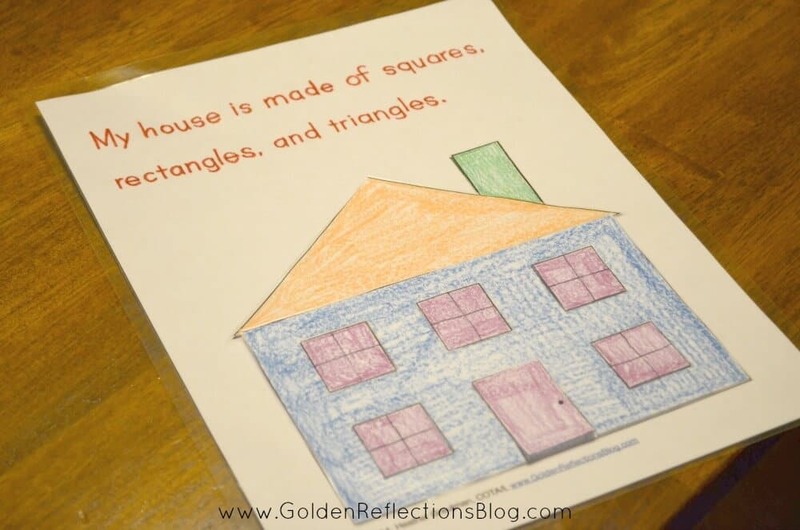 Then they can place the square shapes and rectangle shape for the door on top of the bottom of the house. When laminated, these pieces are much easier to pick up. You can also put tape on the back of each piece if you want the pieces to stay in place after they put it together. If not, then just place the entire puzzle into a gallon zip lock bag for safe keeping after they are done playing! 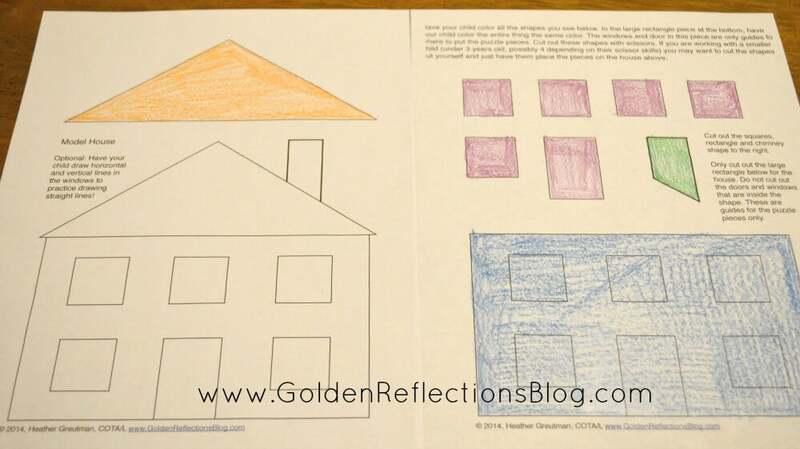 Visual Motor/Eye Hand Coordination – Coloring, placing the shapes in the correct boxes. This activity is part of my new ebook Basic Shapes for Beginners: A Hands-On Approach to Pre-Writing Strokes for Preschoolers.